Authentic IH Farmall seat design like the original available in Red & White Vinyl or Silver Canvas. Cushioned seat is durable and comfortable. Classic styled double-ring base for stability. Comes with a 360-degree, smooth action, ball bearing swivel. Stool legs have glides for easy moving and to prevent scratching. View the assembly instruction guide. Warranty: One year against workmanship defect and flaws. Product replaced at no cost, FOB Renville, MN. 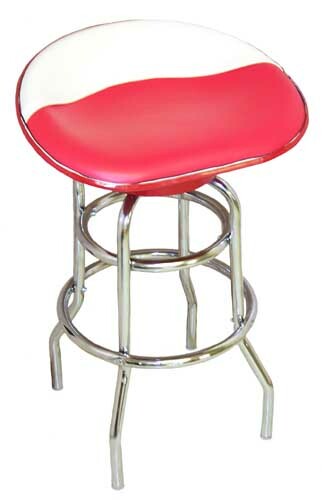 Click the "Buy Now" Button by the tractor seat bar stool you wish to purchase. © 1998-2008 GrainFarmer.com All Rights Reserved.